With React’s new context API you can go a long way with a plain old react app before things become tedious. I encourage you to learn how to use the new context API before you reach for redux. I also have tremendous respect for component setState. Learn how to use it before you start with redux. Did you know setState takes a callback? Did you know you can pass setState an updater function? Did you know that you can declare state changes outside of a component? Using Redux before you understand how to use higher order components can also be a little confusing. Before you start using redux understand higher order components well enough to know when it’s better to use a render prop. If you’re comfortable with context, you’ve mastered setState batching and you know what a prop-namespace-clash is, and you are still finding you app hard to manage then you are going to love redux. I’m giving up stateless functional components for a while. They’re super nice but they’re not worth the refactor when you need a lifecycle method. You could use recompose, which is also super nice, but completely avoidable. Sticking to Class Components means I won’t need Recompose or a refactor. If I’m going with Class Components then I might as well go with Pure Class Components. React.PureComponent stops components from needlessly re-rendering. PureComponent is not something you use on a special occasion, it’s a sensible default. The only reason I’d need to use a regular class component is when I want the component to re-render when a nested prop or value in state changes. Then it’s back to React.Component and a shouldComponentUpdate(). A regular component without a shouldComponentUpdate method is now a red flag for me. When you build a component in React you have the option to explicitly declare the type of props that it can, or must, accept by using the prop-types library. This may seem like pointless extra work when you’re starting out, but when you begin working with other people declaring your props is a fantastic way to communicate how a component can be used and what it needs to work. What you probably didn’t know is that Typechecking also make your code run faster. The V8 engine in chrome has something called Ignition, which is an interpreter. If your code consistently runs without type errors then V8 will skip the interpretation process and jump straight to turbo. Break the rules once and all your code will need to be interpreted from that point onwards. Strongly typed code runs in the fast lane. Create React App automatically reloads css style changes but not other code changes. Adding hot modules to a create-react-app lets you change source code in your app and see the changes without the app reloading. Go to your browser, update some source code and the changes will appear immediately. Unfortunately, your app will lose internal state with any changes. I haven’t figured out a way to maintain state without ejecting or rewiring the app. To rewire you app checkout Dave Ceddia’s article on the topic. If you increment a count in state using a state update function 3 times then the final count will be 3. If you increment state 3 times just using a regular object then the changes will get batched together. Something that often gets overlooked is that setState is asynchronous. State may not change immediately on calling setState because react batches state changes for performance. Please refer to part 3 for how to deploy your application in React + Firestore : Deploying Your Application. 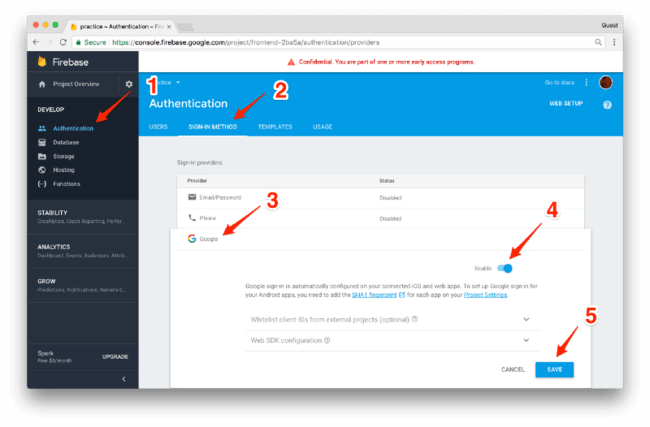 To set up authentication in the firebase console go to the authentication section under DEVELOP in the left-hand pane (1), clicking on the ‘sign-in method’ tab (2), find the provider you want (3) and enabling it (4), before saving your settings (5). We’re going to use Google to sign in because you already have a google account and you’ve connected it by being logged into the firebase console. 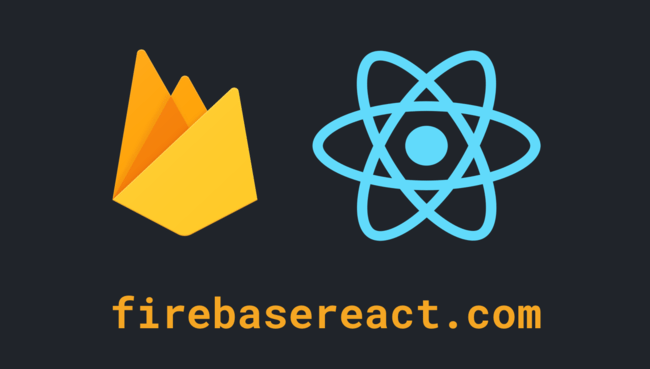 I believe firebase is create-react-app for the backend. It lets you start building full-stack applications without having to get lost in a wormhole of build tools and server-side boilerplate. Using only Firebase and React you can build and deploy a full-stack project set up in a weekend. To get setup please refer to React + Firestore : Get Setup In Five Steps.